Temple Hoyne Buell Hall was designed by Perkins & Will. 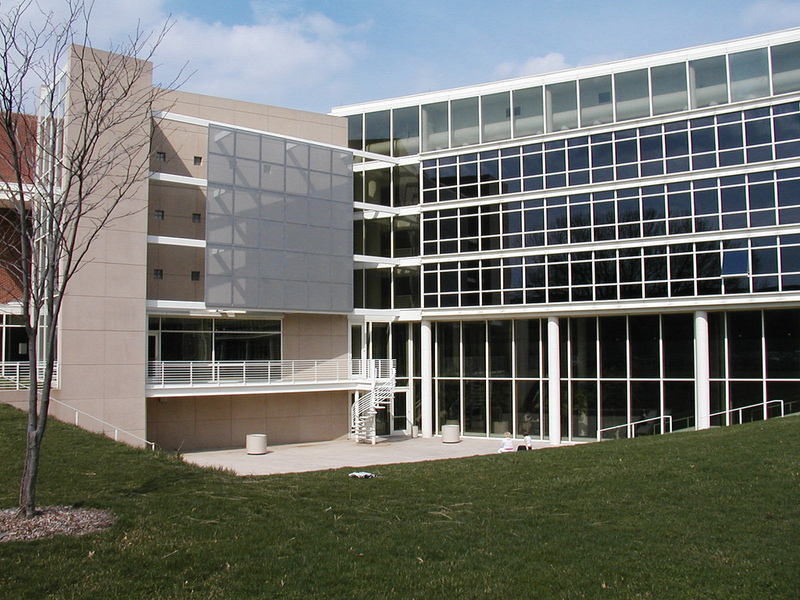 Located in Champaign, the academic building was completed in 1995. Temple Hoyne Buell Hall was built in 1995 in honor of Temple Hoyne Buell himself. Temple Buell studied at the University of Illinois and later graduated at Columbia University. He created the first central mall with parking lots that circle the store. The building houses and intertwines the graduate schools of architecture, landscape architecture, and urban planning. Temple Hoyne Buell Hall has received both the IAA award (Interior Architecture Award) and the DBA (Distinguished Building Award) for its successful interactions between the form of the building. The building also has an easy to understand plan and section. The open space, bridges, and open corridors make a great interior gathering space that allows people to interact. This building is designed for the academic use of the department of Urban and Regional Planning, the Department of Landscape Architecture and the School of Architecture. So, It is a working example of the craft of architecture, a physical representation of the integration of landscape, urban planning and architectural elements. 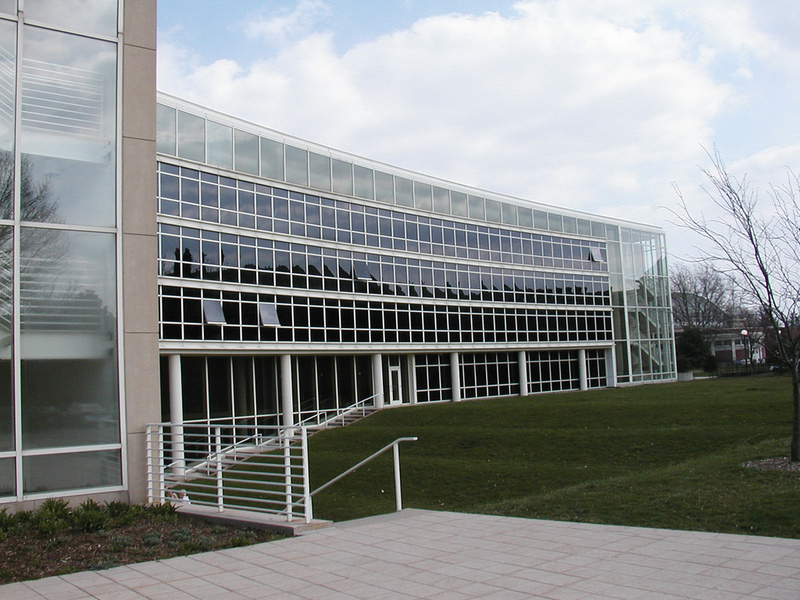 Temple Hoyne Buell Hall, as a building designed for academic use, has several studios, an auditorium, offices and classrooms. 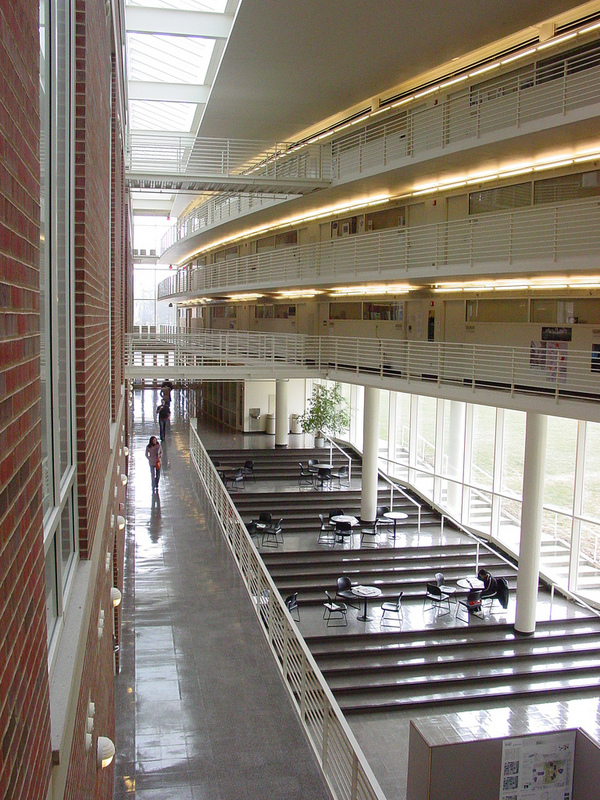 Another typical feature in the building is a atrium in the center of the building where desks and chairs are placed for students and faculty to use. Another notable feature is the huge glass wall on the west side of the building which act as the visual link to the exterior courtyard where the lawn and white stairs are. In 1935 Lawrence B. Perkins and Philip Will Jr. found Perkins & Will in Chicago IL. They are a global design firm and have offices all around the world. They have more LEED accredited professionals than any other firm on North America. They first became nationally known after designing the Crow Island School in Winnetka IL. 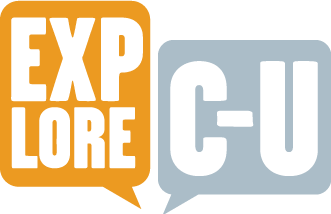 They offer many services such as, civic and cultural, corporate and commercial, federal, healthcare, higher education, K-12 education, science and technology, sports and recreation, and transportation buildings. 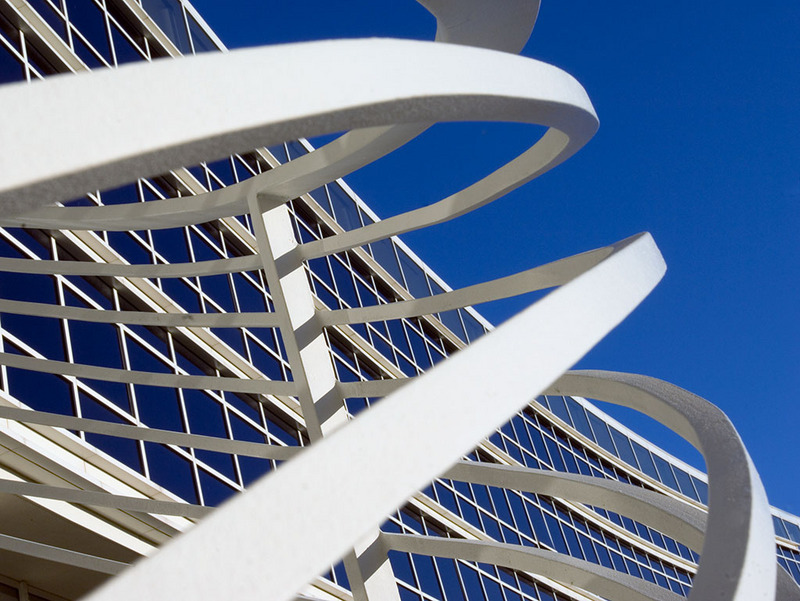 Close up of Temple Hoyne Buell Hall: Image courtesy University of Illinois Public Affairs. Copyright University of Illinois Board of Trustees. 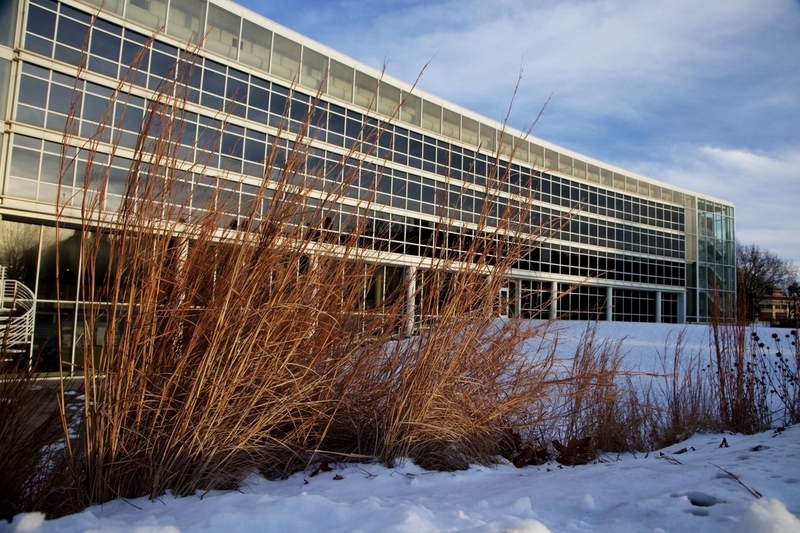 Temple Hoyne Buell Hall in winter: Image courtesy University of Illinois Public Affairs. Copyright University of Illinois Board of Trustees. Tyler Braswell, Michala Freeman, and Qiongjiao Huang, “Temple Hoyne Buell Hall,” ExploreCU, accessed April 20, 2019, https://explorecu.org/items/show/273. "University of Illinois - Temple Hoyne Buell Hall. Perkins+Will Inc. n.d. Web. 12 Nov. 2013. http://www.perkinswill.com/work/university-of-illinois-temple-hoyne-buell-hall.html "Perkins and Will." Wikipedia. Wikimedia Foundation, n.d. Web. 12 Nov. 2013. http://en.wikipedia.org/wiki/Perkins_and_Will “Facilities.” Department of Urban and Regional Planning, Web. 15 Nov. 2013. http://www.urban.uiuc.edu/about/facilities.html “Distinguished Building Award.” AIA Chicago. Web. 12 Nov. 2013. http://www.aiachicago.org/special_features/1998_Design_Awards/DBA/winners/13.html#top “Interior Architecture Award.” AIA Chicago. Web.12 Nov. 2013. http://www.aiachicago.org/special_features/1998_Design_Awards/IAA/winners/20.html “Temple Hoyne Buell Hall.” UIUC facilities & services. Web. 12 Nov. 2013 http://www.fs.uiuc.edu/ada/0339Plan1.html Keegan, Edward. "Prairie Companion." Architecture Aug. 1996: 96. Academic OneFile. Web. 21 Nov. 2013. http://go.galegroup.com/ps/i.do?id=GALE%7CA18637874&v=2.1&u=uiuc_uc&it=r&p=AONE&sw=w&asid=3a4dc56eb8d04c39e9f609b71a257685.